Spare tyre cover durability and look. Your spare tyre cover will be made from high quality durable marine vinyl. This is both UV and FR resistant. Either screen printed or digitally printed in high quality, long lasting inks, makes for a very durable wheel cover. The longevity of the covers can vary greatly depending on the life they receive. A cover that is in the harsh Aussie sun and rain all day, every day will deteriorate a lot quicker than one that spends its life in the garage. We have a 12 month warranty on the covers, however generally they last a lot longer. We have clients who have had over 5 years of use without replacing. We try to describe the covers as best as possible, but you never truly know until you see it. When compared to a lot of generic covers you see around, our covers are generally thicker with better UV resistance. As we custom size every cover, you can be assured it will fit perfectly and enhance the look of your vehicle or caravan. We don't do saggy, bad fitting covers that look bad!! 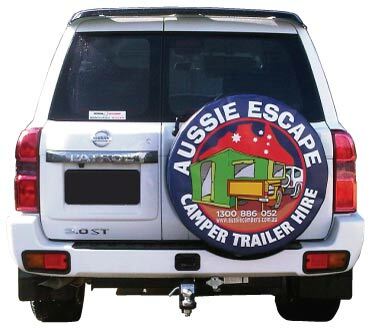 Read more about our spare wheel covers. Please contact us if you have any queries on our spare tyre covers.